Hair loss is primarily caused by a combination of aging, a change in hormones, and a family history of baldness. As a rule, the earlier hair loss begins, the more severe the baldness will become. Hair loss can also be caused by burns or trauma, in which case hair replacement surgery is considered a reconstructive treatment, and may be covered by health insurance. If you and your doctor have determined that hair transplants are the best option for you, you can feel comfortable knowing that board-certified plastic surgeons have been successfully performing this type of procedure for more than thirty years. If you're considering hair replacement surgery, this brochure will give you a basic understanding of the variety of procedures involved. It can't answer all of your questions, since a lot depends on your individual circumstances. Ask your surgeon if there is anything you don't understand about the procedure you plan to have. Baldness is often blamed on poor circulation to the scalp, vitamin deficiencies, dandruff, and even excessive hat-wearing. All of these theories have been disproved. It's also untrue that hair loss can be determined by looking at your maternal grandfather, or that 40-year-old men who haven't lost their hair will never lose it. Hair replacement surgery can enhance your appearance and your self-confidence, but the results won't necessarily match your ideal. Before you decide to have surgery, think carefully about your expectations and discuss them with your surgeon. It's important to understand that all hair replacement techniques use your existing hair. The goal of surgery is to find the most efficient uses for existing hair. Hair replacement candidates must have healthy hair growth at the back and sides of the head to serve as donor areas. Donor areas are the places on the head from which grafts and flaps are taken. Other factors, such as hair color, texture and waviness or curliness may also affect the cosmetic result. 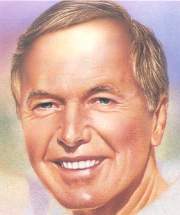 There are a number of techniques used in hair replacement surgery. Sometimes, two or more techniques are used to achieve the best results. Transplant techniques, such as punch grafts, mini-grafts, micro-grafts, slit grafts, and strip grafts are generally performed on patients who desire a more modest change in hair fullness. Flaps, tissue-expansion and scalp-reduction are procedures that are usually more appropriate for patients who desire a more dramatic change. Remember, there are limits to what can be accomplished. An individual with very little hair might not be advised to undergo hair replacement surgery. Some doctors estimate that one in five women will experience some degree of hair loss usually caused by aging, illness, or hormonal changes after menopause. Women tend to experience a subtle thinning all over the scalp rather than losing hair in patches as is common in men. To correct the problem, some women choose to wear a wig or hair extensions. Others have had some success using a topical prescriptive drug. The effectiveness of such drugs varies in some patients and simply prevents further hair loss without stimulating any appreciable new growth. Hair replacement surgery may be the answer for those who feel uncomfortable with either of these options. Because mini-grafts are usually the surgical treatment of choice for filling-in thinning areas, good candidates for this procedure should have dense hair growth at the back of the head. Mini-grafts are harvested from this dense area and replanted in thinning areas to create a fuller look. Occasionally flap and tissue expansion procedures may be used if the individual is judged to be a good candidate. If you're considering a hair replacement procedure, it's important to understand that you will never have the coverage you had prior to your hair loss, but surgery may camouflage the thin areas and give you more fullness. Hair replacement surgery is normally safe when performed by a qualified, experienced physician. Still, individuals vary greatly in their physical reactions and healing abilities, and the outcome is never completely predictable. As in any surgical procedure, infection may occur. Excessive bleeding and/or wide scars, sometimes called "stretch-back" scars caused by tension may result from some scalp-reduction procedures. In transplant procedures, there is a risk that some of the grafts won't "take." Although it is normal for the hair contained within the plugs to fall out before establishing regrowth in its new location, sometimes the skin plug dies and surgery must be repeated. At times, patients with plug grafts will notice small bumps on the scalp that form at the transplant sites. These areas can usually be camouflaged with surrounding hair. When hair loss progresses after surgery, an unnatural, "patchy" look may result-especially if the newly-placed hair lies next to patches of hair that continue to thin out. If this happens, additional surgery may be required. Hair replacement surgery is an individualized treatment. To make sure that every surgical option is available to you, find a doctor who has experience performing all types of replacement techniques-flaps and tissue expansion as well as transplants. Look elsewhere if your doctor tells you that he or she has perfected one technique that can "do it all." In your initial consultation, your surgeon will evaluate your hair growth and loss, review your family history of hair loss, and find out if you've had any previous hair replacement surgery. Your surgeon will also ask you about your lifestyle and discuss your expectations and goals for surgery. Medical conditions that could cause problems during or after surgery, such as uncontrolled high blood pressure, blood-clotting problems, or the tendency to form excessive scars, should also be checked by your doctor. Be sure to tell your surgeon if you smoke or are taking any drugs or medications, especially aspirin or other drugs that affect clotting. If you decide to have hair replacement surgery, your surgeon will explain anesthesia, the type of facility where the surgery will be performed, and the risks and cost involved. Don't hesitate to ask your doctor any questions. Make sure you understand your surgeon's plan-which procedures will be used and how long each will take. Ask your doctor to give you an idea of what you will look like after the procedure or, in the case of grafts, after each stage of treatment. Your surgeon will give you specific instructions on how to prepare for surgery, including guidelines on eating and drinking, smoking, and taking and avoiding certain vitamins and medications. Carefully following these instructions will help your surgery go more smoothly. If you smoke, it's especially important to stop at least a week or two before surgery; smoking inhibits blood flow to the skin, and can interfere with healing. You should arrange for someone to drive you home after your surgery. Plan to take it easy for a day or two after the procedure and arrange for assistance if you think you'll need it. Hair replacement surgery is usually performed in a physician's office-based facility or in an outpatient surgery center. Rarely does it require a hospital stay. Hair replacement surgery, no matter what technique is used, is usually performed using a local anesthesia along with sedation to make you relaxed and comfortable. Your scalp will be insensitive to pain, but you may be aware of some tugging or pressure. General anesthesia may be used for more complex cases involving tissue expansion or flaps. If general anesthesia is used, you'll sleep through the procedure. 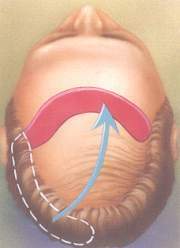 Hair transplantation involves removing small pieces of hair-bearing scalp grafts from a donor site and relocating them to a bald or thinning area. Grafts differ by size and shape. Round-shaped punch grafts usually contain about 10-15 hairs. The much smaller mini-graft contains about two to four hairs; and the micro-graft, one to two hairs. Slit grafts, which are inserted into slits created in the scalp, contain about four to10 hairs each; strip grafts are long and thin and contain 30-40 hairs. Generally, several surgical sessions may be needed to achieve satisfactory fullness-and a healing interval of several months is usually recommended between each session. It may take up to two years before you see the final result with a full transplant series. The amount of coverage you'll need is partly dependent upon the color and texture of your hair. Coarse, gray or light-colored hair affords better coverage than fine, dark-colored hair. The number of large plugs transplanted in the first session varies with each individual, but the average is about 50. For mini-grafts or micro-grafts, the number can be up to 700 per session. Just before surgery, the "donor area" will be trimmed short so that the grafts can be easily accessed and removed. For punch grafts, your doctor may use a special tube-like instrument made of sharp carbon steel that punches the round graft out of the donor site so it can be replaced in the area to be covered-generally the frontal hairline. For other types of grafts, your doctor will use a scalpel to remove small sections of hair-bearing scalp, which will be divided into tiny sections and transplanted into tiny holes or slits within the scalp. When grafts are taken, your doctor may periodically inject small amounts of saline solution into the scalp to maintain proper skin strength. The donor site holes may be closed with stitches-for punch grafts, a single stitch may close each punch site; for other types of grafts, a small, straight-line scar will result. The stitches are usually concealed with the surrounding hair. To maintain healthy circulation in the scalp, the grafts are placed about one-eighth of an inch apart. In later sessions, the spaces between the plugs will be filled in with additional grafts. Your doctor will take great care in removing and placement of grafts to ensure that the transplanted hair will grow in a natural direction and that hair growth at the donor site is not adversely affected. After the grafting session is complete, the scalp will be cleansed and covered with gauze. You may have to wear a pressure bandage for a day or two. Some doctors allow their patients to recover bandage-free. Plastic surgeons are the leaders in tissue expansion, a procedure commonly used in reconstructive surgery to repair burn wounds and injuries with significant skin loss. Its application in hair replacement surgery has yielded dramatic results-significant coverage in a relatively short amount of time. 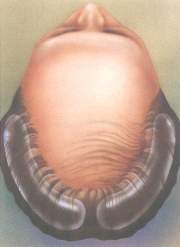 In this technique, a balloon-like device called a tissue expander is inserted beneath hair-bearing scalp that lies next to a bald area. The device is gradually inflated with salt water over a period of weeks, causing the skin to expand and grow new skin cells. This causes a bulge beneath the hair-bearing scalp, especially after several weeks. When the skin beneath the hair has stretched enough-usually about two months after the first operation-another procedure is performed to bring the expanded skin over to cover the adjacent bald area. For more information about tissue expansion, ask your plastic surgeon for the American Society of Plastic and Reconstructive Surgeons, Inc. brochure entitled, Tissue Expansion: Creating New Skin from Old. Flap surgery on the scalp has been performed successfully for more than 20 years. This procedure is capable of quickly covering large areas of baldness and is customized for each individual patient. The size of the flap and its placement are largely dependent upon the patient's goals and needs. One flap can do the work of 350 or more punch grafts. A section of bald scalp is cut out and a flap of hair-bearing skin is lifted off the surface while still attached at one end. The hair-bearing flap is brought into its new position and sewn into place, while remaining "tethered" to its original blood supply. As you heal, you'll notice that the scar is camouflaged-or at least obscured-by relocated hair, which grows to the very edge of the incision. In recent years, plastic surgeons have made significant advances in flap techniques, combining flap surgery and scalp reduction for better coverage of the crown; or with tissue expansion, to provide better frontal coverage and a more natural hairline. 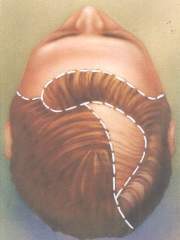 This technique is sometimes referred to as advancement flap surgery because sections of hair-bearing scalp are pulled forward or "advanced" to fill in a bald crown. Scalp reduction is for coverage of bald areas at the top and back of the head. It's not beneficial for coverage of the frontal hairline. 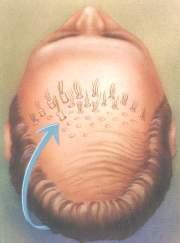 After the scalp is injected with a local anesthetic, a segment of bald scalp is removed. The pattern of the section of removed scalp varies widely, depending on the patient's goals. If a large amount of coverage is needed, doctors commonly remove a segment of scalp in an inverted Y-shape. Excisions may also be shaped like a U, a pointed oval, or some other figure. The skin surrounding the cut-out area is loosened and pulled, so that the sections of hair-bearing scalp can be brought together and closed with stitches. It's likely that you'll feel a strong tugging at this point, and occasional pain. How you feel after surgery depends on the extent and complexity of the procedure. Any aching, excessive tightness, or throbbing can be controlled with pain medication prescribed by your physician. If bandages are used, they will usually be removed one day later. You may gently wash your hair within two days following surgery. Any stitches will be removed in a week to 10 days. Be sure to discuss the possibility of swelling, bruising, and drainage with your surgeon. Because strenuous activity increases blood flow to the scalp and may cause your transplants or incisions to bleed, you may be instructed to avoid vigorous exercise and contact sports for at least three weeks. Some doctors also advise that sexual activity be avoided for at least 10 days after surgery. To make sure that your incisions are healing properly, your doctor will probably want to see you several times during the first month after surgery. It's important that you carefully follow any advice you receive at these follow-up visits. How soon you resume your normal routine depends on the length, complexity and type of surgery you've had. You may feel well enough to go back to work and resume normal, light activity after several days. Many patients who have had transplants (plugs or other grafts) are dismayed to find that their "new" hair falls out within six weeks after surgery. Remember, this condition is normal and almost always temporary. After hair falls out, it will take another five to six weeks before hair growth resumes. You can expect about a half-inch of growth per month. You may need a surgical "touch-up" procedure to create more natural-looking results after your incisions have healed. Sometimes, this involves blending, a filling-in of the hairline using a combination of mini-grafts, micro-grafts, or slit grafts. Or, if you've had a flap procedure, a small bump called a "dog ear" may remain visible on the scalp. Your doctor can surgically remove this after complete healing has occurred. In general, it's best to anticipate that you will need a touch-up procedure. Your surgeon can usually predict how extensive your follow-up surgery is likely to be.